Is it possible to be a pragmatist and not do mixed-methods research? It seems that in many cases, pragmatism and mixed-methods research are considered one-in-the-same. 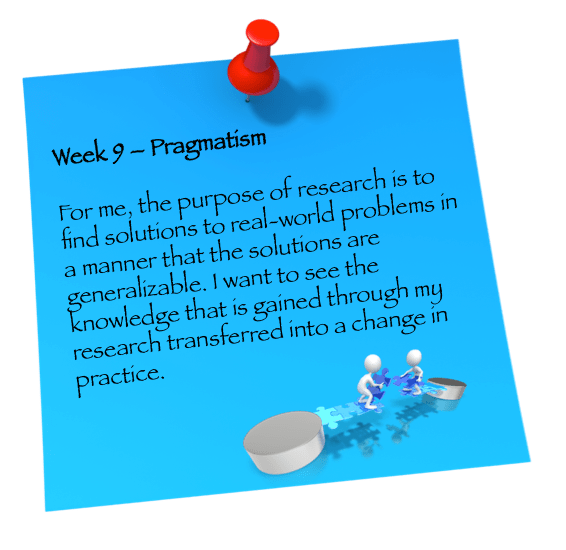 I can see that if you are doing mixed-methods research, you are necessarily taking a pragmatic approach, but is the same the same true in the other direction? Am I, as a pragmatist, allowed to do research that isn’t mixed methods? A month ago, when I was working on a scholarship research proposal, I realized that I needed to use the research question to determine my research method. The idea of mixed-methods is that you use both qualitative and quantitative methods in order to better answer the question. The methods can be mixed as long as they share an ontological perspective, that is, that they both see the nature of the world in the same way. Guba and Lincoln (2005) don’t see any problems with mixing methods as long as you don’t mix paradigms (or world-views). I think a key word here is methods and not methodologies. Since the methods are just the mechanical processes for collecting and analyzing data – they aren’t the wholistic processes for research. Methodology is necessarily related to paradigms because methodologies are ways in which to implement methods in the context of a specific world-view. One challenge that I have is that I’m a pragmatist – in that I believe in using “whatever works” to answer the research question. For me, the purpose of research is to find solutions to real-world problems in a manner that the solutions are generalizable. I want to see the knowledge that is gained through my research transferred into a change in practice. So what happens if the best way to answer my question doesn’t require qualitative or quantitative methods? Can it be answered with only one? Originally, I thought this might be possible and I struggles with how I could both be a pragmatist and only do action research, but then I realize that if I really want something to be “transferable” as in “the extent to which we can take the things that we learn with one type of method in one specific setting and make the most appropriate use of that knowledge in other circumstances” (Morgan, 2008, p.60), makes me wonder if really, I would need to be doing research that is first qualitative (the discovery phase and the action phase) followed with quantitative research (the proving stage). That certainly seems to me to be a very logical way to approach research. What do you think? Can you be a pragmatist and only do qualitative or quantitative research? Or do you need to mix your methods? Guba, E., & Lincoln, Y. S. (2005). Paradigmatic controversies, contradictions, and emerging confluences. In N. K. Denzin & Y. S. Lincoln (Eds. ), Handbook of qualitative research (pp. 191-215). Thousand Oaks, CA: Sage. Morgan, D. L. (2008). Paradigms lost and pragmatism regained: Methodological implications of combining qualitative and quantitative methods. In V. Plano-Clark & J. Creswell (Eds. ), The mixed methods reader (pp. 29-65). Thousand Oaks, CA: Sage Publications. I agree that i think the real question is: What is your research question? Then, and only then, can you the determine which methods would be most appropirate in exploring/answering that question. Not the other way around… It's all in the question! What is the problem that you have to solve? Can you define the problem? That could help you in determining which method is more appropriate. Both methods could be used, irrespective of whether you are pragmatist or not, but a qualitative method based on narratives, interviews, and SNA (Social network analysis) would help in "looking into the problem" whereas quantitative method using a scientific approach (i.e. hypothesis testing and validation) could be better confirmed using surveys and experiments. However, there are merits and demerits with the mere use of either of them, and just mixed methods have been proposed and used to ensure that "both sides of the coin are checked." In case of the tackling of wicked problem, then the research starts with asking the right questions, instead of searching for the right solutions.